Yesterday I ran my third race of the year, the Lakefront 10 miler. Based on the finisher medals in the basement, I've run this at least half a dozen times. Though there were undoubtedly years when they didn't give a finisher medal. Personally, I prefer my race entry fee go towards a finisher medal to the T-shirt they generally give though there has been a switch from useless cotton T-shirt to Technical Shirt that you can run in, which kinda makes sense for runners. I arrived about 15 minutes before race start (based on the timestamp of my parking meter receipt) which was enough time to get to the start but not enough to risk gear check. Fortunately, when you park so close to the starting line, your car is a better gear check anyway. Saw B before the race and MH on the course twice. Did not see SHB and couldn't find race results for her. I suspect she didn't make the race after all. There was the expected pre-race acknowledgement of what happened in Boston last week and more people paid attention during the playing of the Star Spangled Banner than usual for a race. I've always thought it was ridiculous to ask runners to take off their headbands and hats for this. 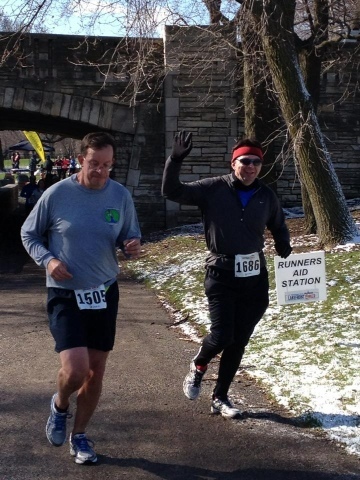 After the race started I saw someone from my CARA summer training group and said hello. It turns out several of our 8:30 pace group was running this race. Thursten Howell the IV told me that everyone was talking about meeting for breakfast afterwards and considering one of my past suggestions, Julius Meinl. Since I knew I was not going to be able to hold pace with Howell the IV so we made plans to meet at a designated spot post race. I had a better race than I did last year. 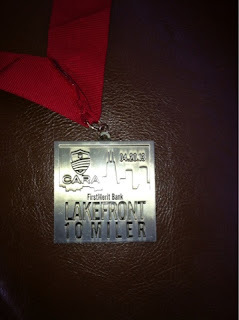 My overall time (1:24:27) was about five minutes faster and my pace was a good 36 seconds faster than last year's effort. That said, it was still a tough run. I haven't run more than 6 miles at a time this year and I'm sure I posted positive splits. I ran the whole thing with very short walk breaks at select water stations. This was to give me a quick rest and often a chance to adjust my tights. It felt very warm during the run, too hot for three layers but too cold for only two. At the finish, I cooled off very quickly and couldn't wait to change into my dry shirts. Last year I finished just under 1:30 and I recall I walked a little more. This year there was a better experience though I did notice more people passing me than the other way around. Assuming I can be consistent with my running and shed a few more pounds (203 lbs that AM) I should be able to shave a couple more minutes off my time at the SF10 next month. So after the race, once I caught my breath, I found everyone and since we were getting cold, we opted to head for Meinl skipping the post race party (who really needs a cold beer at 9:30 anway). It was a very large group and we took over the back section of Meinl. We talked about what we had been up to and what we were training for, and what we were gonna do this summer running wise. We talked about Boston, of course. One of the young fast runners who is also very involved in the young adult catholic community pointed out how great it was that our runner community is so positive and uplifting and friendly. I kinda wish our Catholic Community could be the same way I almost told him. I didn't want to burst that bubble though. He is onto something though. The Runner Community has this shared bond that the Catholic Mass attempts to achieve through the Communion Ritual (with various degrees of success). Except for a very small number of self-centured or standoffish runners, most of us are able to connect with each other whether you've run 1 marathon or a dozen, or even none-at-all. We've all had races were we ran like the wind and runs where we sucked wind. If you do this long enough, you've had the joy of acheiving a new Personal Best along with the sorrow of missing a BQ by that much. It's a community I felt exiled from in 2009 and 2011 when I wasn't training for a marathon. It wasn't an intential exile unlike the one I'm experiencing with my Catholic Friends but rather a out-of-sight, out-of-mind kind of exile. Hopefully I can continue to improve my running stamina enough to avoid that exile again.